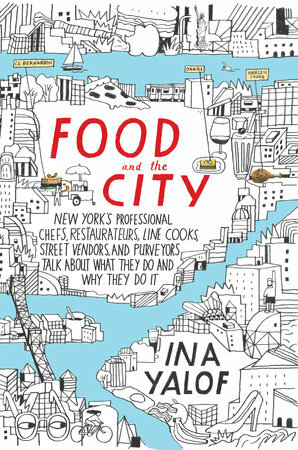 Ina Yalof’s new book, Food and the City: New York’s Professional Chefs, Restaurateurs, Line Cooks, Street Vendors, and Purveyors Talk About What They Do and Why They Do It, is due out May 31, 2016. The book, essentially a collection of oral histories, is divided into nine sections, each dealing with a different aspect of professional cooking or food supply. Yalof presents a brief introduction to each section, and then lets the professionals speak for themselves. What makes Yalof’s book interesting are the themes that unite so many of the stories. There are many immigrants, each discussing why they left Greece or Nicaragua in search of financial success or stability in America, and how work in the food industry provided them with that. There are numerous examples of people abandoning other careers, sometimes successful ones, in the financial sector, in veterinary medicine, to pursue careers in food, whether as food cart operators, restaurant owners, or pastry chefs. In these cases, nearly every person was driven by a passion: either to work with their hands, to be their own boss, or to immerse themselves in the frenetic and cocksure world of gastronomy. The other feature that differentiates this book from other food guides or histories is that the stories here are told by the involved parties. The narrative voice changes within each profile, which adds another layer to the stories. In some, you can almost hear an accent come off the page, whether from Italy, Mexico, or just the South Bronx. Each one is distinct, much like the foods made, and chosen with discretion by Yalof. In addition to covering these traditional categories of food purveyors like chefs and cooks, she has a section on “Crowd Feeding,” which includes a profile from the chief overseer of food service operations for all of New York City’s Department of Corrections. The last section, “Counter Culture,” features some of New York’s most famous walk-in establishments, and one oral history is from an 84-year-old lox slicer at Zabar’s. These distinct voices all come to life while reading the book, even if I, an erstwhile vegetarian, have a difficult time stomaching some of the narratives (the family-owned duck farm on Long Island springs to mind). 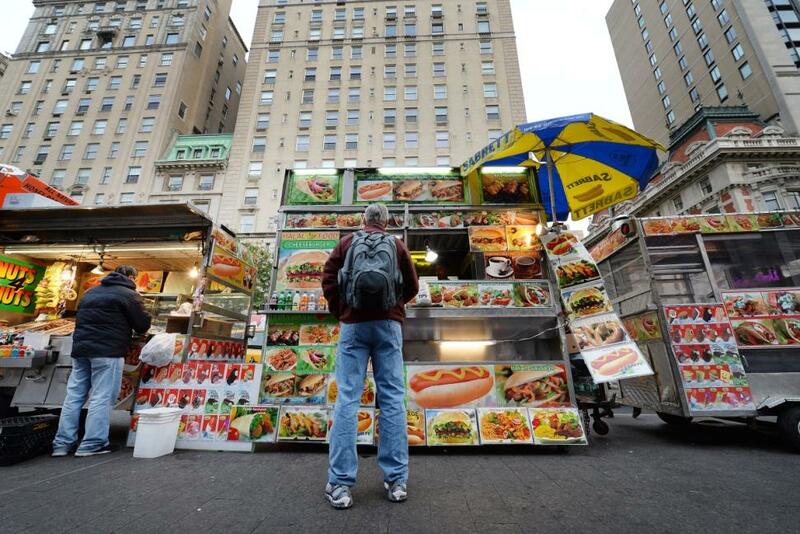 New York is almost unique as a food city. There are so many restaurants that many of them are famous for, or indeed focus on, one specific food item. And New Yorkers like to know all the restaurants, in their neighborhood certainly, and have strongly felt opinions on them. The only thing missing in Food and the City was some ink devoted to that other particular aspect of food in New York — delivery. Now it’s your turn. 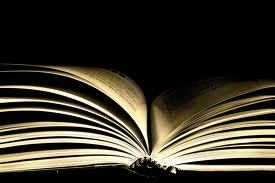 Choose one of both of these questions to expound on: What’s your favorite cookbook or work of gastronomic literature? OR Do you know the history of any of your favorite restaurants? This entry was posted in Book Reviews and tagged Books about Food, Food and the City, Growth of Food Carts, Immigrants and the Food Industry, Ina Yalof, Len Berk lox slicer at Zabar's, New York City Food Guides, New York Food Books, Oral History as Narrative Style, Pursuing Careers in Food Industry. Bookmark the permalink. Hard to choose favorites, but there’s one book on my shelf that is both a cookbook and a gastronomic history: Edna Lewis’s The Taste of Country Cooking. This beautifully written book combines recipes with stories about Lewis’s youth in a rural African-American community in early twentieth-century Virginia. Thank you for the review. I can think of several people who would enjoy this book! Kate, thanks for your comment. Edna Lewis is certainly the grand dame of Southern cooking. Since Mama put this book together when she was in her 80s, with poor eyesight and arthritic hands, it looks very amateurish, despite its beautiful cover of one of my grandmother’s watercolors. But reading it is an adventure in meeting relatives I’ve never known and exploring foods I’ve never heard of elsewhere (ex. syllabub) and reliving a day with my mother.. 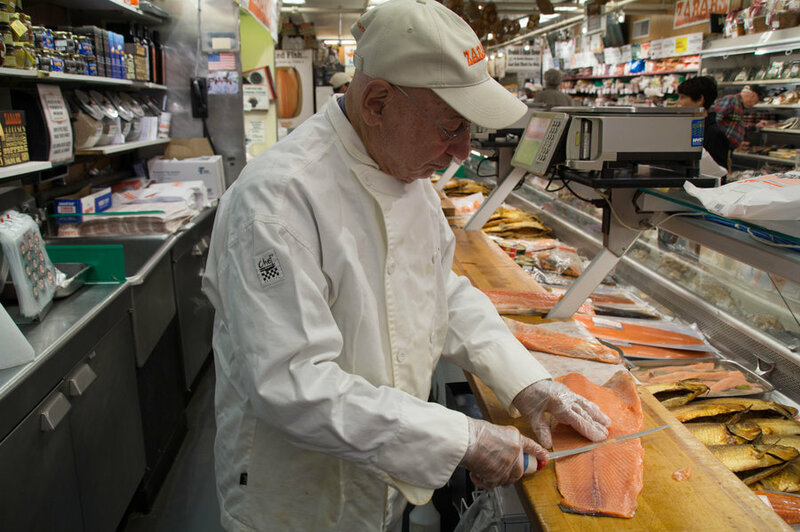 I love the photo of Len at Zabar’s. I’ve been hearing that name for a long time, as they are supporters of NPR’s selected shorts. Now, I have a face to put with the name. Fun article. I have frequented Boston much more than New York, so I will admit that I am rather ‘green’ when it comes to the City. Hope to get there, soon, though!